Welcome to the AMAZING new world of Novarmere in Book One: The Candlestick Dragon by Melanie Ifield. This post was submitted by Melanie Ifield. A mysterious candlestick, a dangerous wizard and a talking dragon! Daniel wanted a change in his life – he just had no idea what was coming! Daniel sat back and looked at his handy work. The stonework was clear of debris and the dragon’s scales, spikes and ridges were clear of dirt. The only trouble was he definitely needed a new paint job. ‘I might even touch up your eyes. They should be fire engine red,’ said Daniel. He looked at them closely. They looked back at him closely. Daniel frowned. Were they really looking at him or was it a trick of the light? He bent to pick up the candlestick, to move it closer to the window. The eyes blinked. The discovery of a dragon wrapped around a candlestick changes Daniel Smith’s life forever. After finding Nilofar and the magical doorway into the land of Novarmere, Daniel uncovers a plot to destroy the bond between the heir of the throne and the magical land in which they live. With the help of his new friends, Daniel must race against time to reunite the Princess of Novarmere with the sceptre of her people before her thirteenth birthday: the fate of an entire nation rests in his hands. Will Daniel be able to overcome his fears and defeat the powerful dark wizard in time to save them all? I submitted this book to this website because Segilola Salami is a fellow author, and as such, a part of my community! Please leave a comment below and click one of the icons below to share this page. Many thanks! 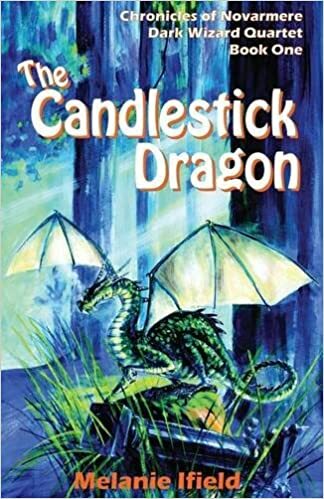 This entry was posted in Uncategorized and tagged children's book, children's books, fantasy book, fantasy children's book, Melanie Ifield, The Candlestick Dragon, The Candlestick Dragon by Melanie Ifield. Bookmark the permalink. ← What could you do with £5? Fiver Challenge for Kids!